The PortAmore' wine tote comes with two wine glasses and a Franmara corkscrew. Constructed from European shoulder leather and insulated with neoprene, this wine tote will keep your chilled bottles cool for up to four hours! Handcrafted from the finest materials available, the PortAmore' Wine tote provides everything a wine enthusiast needs to enjoy a favorite vintage on the go. Each bag is carefully assembled from hand selected leathers, with an emphasis on practical elegance and durability. 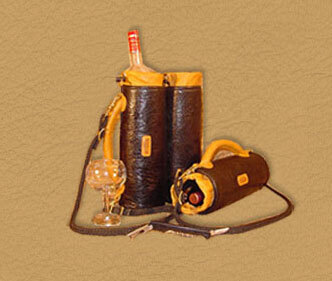 It is our hope here at Powell Leather that your PortAmore' wine tote will offer a lifetime of satisfying outings.